When it comes to finding the right three-row crossover for family or individual needs, there are plenty of vehicles on the road, but which ones offer the most value? In this 2019 Volkswagen Atlas vs 2019 Ford Explorer comparison we are going to look at two options to see which one offers the best features and advantages. Each of these models brings different strengths to the road. While the 2019 Ford Explorer has three engine options and generally offers more horsepower and torque than the Atlas's two engine options, it falls behind in several key areas that offer value to families. One is interior space. Both of these crossovers have up to seven seats, but the 2019 Volkswagen Atlas can deliver up to 96.8 cubic feet of cargo space with its back rows folded down. In contrast, the 2019 Ford Explorer offers just 80.7 cubic feet. This means that the 2019 Atlas can deliver more spacious and comfortable driving. In addition to offering the top interior space in this 2019 Volkswagen Atlas vs 2019 Ford Explorer comparison, the Volkswagen three-row crossover can pay off in other ways. The base engine of the 2019 Atlas offers significantly better fuel economy than the base engine of the 2019 Explorer. While drivers willing to upgrade to upper trims and engines may be able to save a little with the 2019 Ford Explorer, the 2019 Volkswagen Atlas has a strong advantage. Added to the lower starting price of the 2019 Volkswagen Atlas, this means that families on a budget can save in big and small ways by opting for the VW. The 2019 Volkswagen Atlas also offers impressive technology features that can satisfy many different drivers. Available features like a panoramic sunroof, a hands-free and remote-activated power liftgate, the Volkswagen Digital Cockpit, SirisuXM All Access, and a Fender Premium sound system can add a little extra convenience and fun to the daily driving experience. 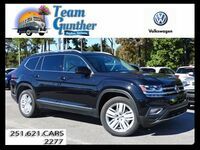 Would you like to experience for yourself the value of the 2019 Volkswagen Atlas in the Mobile AL area? 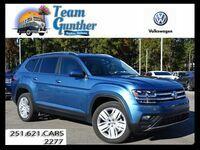 Contact a representative from Team Gunther Volkswagen in Daphne AL today.